OBIEE with the help of its presentation capabilities facilitates viewing the results of analysis in a meaningful way in different types of views such as graphs, pivot tables. It allows display of summary to more detailed information and many more options like using filters, etc.This article helps the user for to understand about OBIEE Views.In my previous article i have given the idea about OBIEE tutorials. You can edit or delete an existing view, add another view to an analysis and can also combine views. The choice of the view depends on the type of columns that the analysis contains. Table view : If the analysis contains only attribute columns/only measure columns or a combination of both. Pivot table : Default view if the analysis contains at least one hierarchical column. Title view: Displays the name of the saved analysis. Displays a title, a subtitle, a logo, a link to a custom online help page and timestamps to the results. Table view is most common view of OBIEE.When user tries to create a report that specific view is called as table view. Example: Following is the table view. Displays results in a pivot table, which provides a summary view of data in cross-tab format and enables users to see different views of data by dragging and dropping rows and columns. Pivot tables and standard tables are similar in structure but Pivot table can contain column groups and can also display multiple levels of both row and column headings. Pivot table cell contains a unique value. Pivot table is more efficient than a row-based table. It is best suited for displaying a large quantity of data, for browsing data hierarchically, and for trend analysis. Performance tiles are used to display a single aggregate measure value in a manner that is visually simple but provides a summary metrics to the user that will likely be presented in more detail within a dashboard view. Performance tiles are used to focus the user’s attention on simple, need-to-know facts directly and prominently on the tile. Communicate status through simple formatting by using color, labels, and limited styles, or through conditional formatting of the background color or measure value to make the tile visually prominent. For example, if revenue is not tracking to target, the revenue value may appear in red. Respond to prompts, filters, and user roles and permissions by making them relevant to the user and their context. Support a single, aggregate or calculated value. Tree map are used to display a space-constrained, 2-d visualization for hierarchical structures with multiple levels. Treemaps are limited by a predefined area and display two levels of data. Contain rectangular tiles. The size of the tile is based on a measure, and the color of the tile is based on a second measure. Treemap are similar to a scatter plot graphs in that the map area is constrained, and the graph allows you to visualize large quantities of data and quickly identify trends and anomalies within that data. Trellis displays multi-dimensional data shown as a set of cells in a grid form and where each cell represents a subset of data using a particular graph type. The trellis view has two subtypes − Simple Trellis and Advanced Trellis. Simple trellis views are ideal for displaying multiple graphs that enable comparison of like to like. Advanced trellis views are ideal for displaying spark graphs that show a trend. 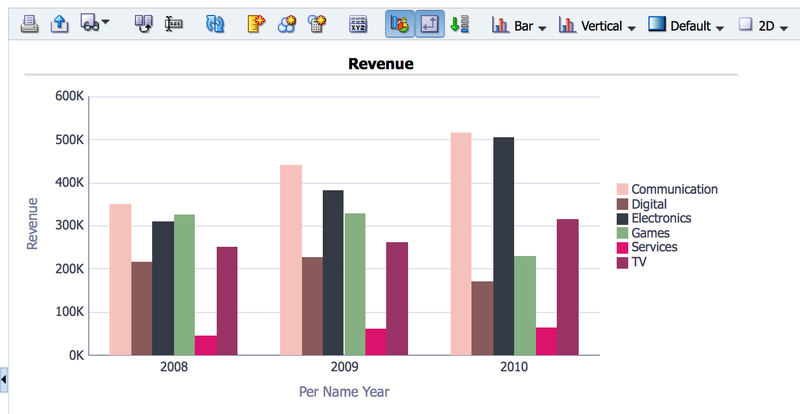 A simple trellis displays a single inner graph type, Example − a grid of multiple Bar graphs. An advanced trellis displays a different inner graph type for each measure. Example: A mixture of Spark Line graphs and Spark Bar graphs, alongside numbers. Graph displays numeric information visually which makes it easier to understand large quantities of data. Graphs often reveal patterns and trends that text-based displays cannot. A graph is displayed on a background, called the graph canvas. Gauges identify problems in data. A gauge usually plots one data point with an indication of whether that point falls in an acceptable or unacceptable range. Thus, gauges are useful for showing performance against goals. A gauge or gauge set is displayed on a background, called the gauge canvas. Funnel displays results in 3D graph that represents target and actual values using volume, level, and color. Funnel graphs are used to graphically represent data that changes over different periods or stages. Example: Funnel graphs are often used to represent the volume of sales over a quarter. Funnel graphs are well suited for showing actual compared to targets for data where the target is known to decrease (or increase) significantly per stage, such as a sales pipeline. Map view is used to display results overlain on a map. Depending on the data, the results can be overlain on top of a map as formats such as images, color fill areas, bar and pie graphs, and variably sized markers. Filter are used to displays the filters in effect for an analysis. Filters allows you to add condition to an analysis to obtain results that answer a particular question. Filters are applied before the query is aggregated. Selection steps are used to displays the selection steps in effect for an analysis. Selection steps, like filters, allow you to obtain results that answer particular questions. Selection steps are applied after the query is aggregated. Column selector is a set of drop-down lists that contain pre-selected columns. Users can dynamically select columns and change the data that is displayed in the views of the analysis. A view selector is a drop-down list from which users can select a specific view of the results from among the saved views. It enables you to document the meaning of special formatting used in results-meaning of custom colors applied to gauges. It displays the results as one or more paragraphs of text. It displays the results as a ticker or marquee, similar in style to the stock tickers that run across many financial and news sites on the Internet. You can also control what information is presented and how it scrolls across the page. You can use HTML to add banners, tickers, ActiveX objects, Java applets, links, instructions, descriptions, graphics, etc. in the results. It displays the SQL statement that is generated for an analysis. This view is useful for trainers and administrators, and is usually not included in results for typical users. You cannot modify this OBIEE Views , except to format its container or to delete it. It is used to display a Create Segment link in the results. It is used to display a create target list link in the results. Users can click this link to create a target list, based on the results data, in their Oracle’s Siebel operational application. This view is for users of Oracle’s Siebel Life Sciences operational application integrated with Oracle’s Siebel Life Sciences Analytics applications. All view types except logical SQL view can be edited. Each view has its own editor in which you can perform edit task. Each view editor contains a unique functionality for that view type but might also contain functionality that is the same across view types. Open the analysis that contains the view to edit. Click the “Analysis editor: Results tab.” Then the Edit View button for the view. Using the view editors displayed, make the required edits, click done and save the view. A compound layout − If you remove a view from a compound layout, it is only removed from the compound layout and not from the analysis. An analysis − If you remove a view from an analysis, it removes the view from the analysis and also from any compound layout to which it had been added. A compound layout − In the view in the Compound Layout → click the Remove View from Compound Layout button. An analysis − In the Views pane → select the view and then click the Remove View from Analysis toolbar button. These are different types of views in OBIEE .Hope everyone will like the article on OBIEE views.Please comment on comment section if you have any issues or concerns.